Check this page often for press coverage updates about H&R Studio, as well as news about co-founders Brett F. Harvey and Lauren Amalia Redding. If you are a member of the press and would like access to our Digital Press Kit and/or Press Releases, please Email Us. Three of co-founder Lauren Amalia Redding’s drawings are included in “Silverpoint,” an exhibition of only six contemporary metalpoint artists running from February 11th through the 22nd at Didier Aaron Gallery in Manhattan’s Upper East Side. The exhibition revolves around a book signing for Silverpoint & Metalpoint Drawing: A Complete Guide to the Medium. Lauren’s work was also included in Silverpoint & Metalpoint Drawing, written by the prolific and generous Susan Schwalb and Tom Mazzullo. If you’re in Manhattan on February 13th and have a chance, join the book signing at Didier Aaron and take the chance to view some lovely, diverse metalpoint works, rarely on view and best seen in person. Many thanks to Didier Aaron, Susan Schwalb, and Tom Mazzullo for making this happen! The Art Grind podcast, hosted by Dina Brodsky, Tun Myaing, and Marshall Jones, recently featured co-founder Lauren Amalia Redding as the guest for their nineteenth episode. For Lauren’s episode, Art Grind merged with another podcast project of Brodsky and Myaing’s entitled Creative Survival. Both podcasts conduct lively, long-form interviews with artists, the former focusing more on their overarching philosophies and the latter more on their backgrounds and emerging careers. Lauren’s episode was recorded in 2017, and in it, she speaks of the long-term goals that ended up inspiring and forming H&R Studio! Many thanks to the dynamic team behind Art Grind for including her and check out more of their great content here! Minus 37, an online art platform focusing on artists younger than thirty-seven years old and based out of Sydney, Australia, graciously featured co-founder Brett F. Harvey in an article written by Katarina Petric. The article explores Brett's philosophy regarding his own sculpture, which, in turn, encompasses all of sculpture. 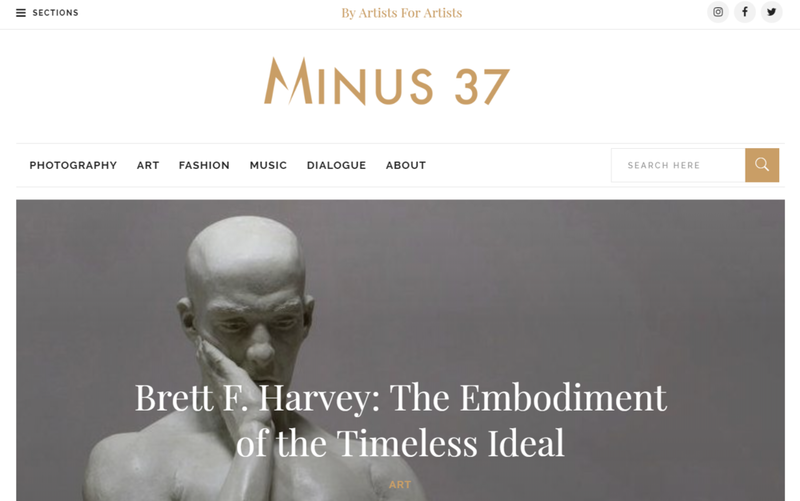 Click here to read "Brett F. Harvey: The Embodiment of the Timeless Ideal," and many thanks again to the team at Minus 37 and Ms. Petric! On Saturday, August 25th, 2018, Sugarlift hosted DRAW, an art event in New York that utilized the city's most iconic artery: the subway. Artists participating in DRAW sketched as they rode the subway that afternoon, then hung their completed works in a pop-up exhibition in Manhattan's Lower East Side. Co-founder Lauren Amalia Redding was one of the participating artists invited by Sugarlift to host and create work. Not only was this a very fitting end to Lauren's time living in New York City with co-founder Brett F. Harvey, but the exhibition sales went towards a great cause. Young New Yorkers encourages at-risk youth to create art in order to keep them out of jail, and all proceeds from DRAW benefited the program. A fun event with a wonderful purpose, it was a bittersweet bookend to Brett and Lauren's life in New York! Co-founder Lauren Amalia Redding wrote a full-length article, "Painting is Not Dead," about H&R Studio for the July/August 2018 issue of Artists on Art. A digital magazine published by Streamline Publishing, which notably publishes Fine Art Connoisseur, Lauren's article delves deep into the inspiration and impetus behind the founding of H&R Studio.